Leaders today are having to navigate across increasingly complex organisations as well as dealing with market volatility and uncertainty, digital disruption and different expectations of how a leader should behave. However, many leaders still focus on the twentieth century model of leadership, where individual performance is the priority. Leaders with the most impact today take a broader view to deliver stronger business performance as a collective. The diagram below summarises the skills needed for Network Leadership. It goes beyond traditional models of transactional and transformational leadership. At the heart of Network Leadership are the concepts of interaction, relationships, systems building, and partnerships. 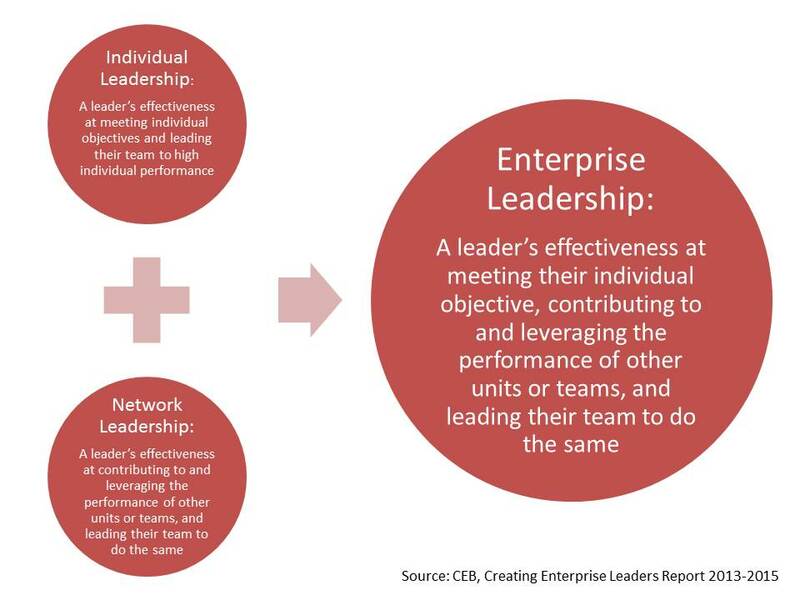 The Enterprise Leadership model from CEB/SHL builds on the concepts of network leadership to embrace a wider set of leadership competencies which assesses individual and network leadership contribution. The diagram below illustrates the unique combination of behaviours which amounts to what we call Enterprise Leadership. This model goes much further than traditional leadership models in defining what makes a business leader effective. It focuses on the importance of individual leadership contribution and network leadership to high performance at the enterprise level. Most 360-degree feedback models are inadequate for executive level cohorts because of this. Traditional 360-degree feedback projects concentrate on the behaviours of leadership from the perspective of individual leadership contribution and the effectiveness of the leader at a functional level. Some assessments may identify ‘silo’ mentalities, but most do not provide further data around these themes. Well-designed 360-degree feedback models are often effective to a limited extent, in that individual competencies around transformational and transactional leadership can be effective in helping the participant to understand their relationships with peers, their leaders, team members and even customers. However, such measures tend to be one dimensional and will only go as far as to measure the individual leadership competencies as opposed to the Enterprise level skills needed around cross functional working, influence across the organisation and the leader’s contribution to organisational outcomes. Why is enterprise leadership important? Teams experience higher levels of engagement and customer satisfaction when their leader is an enterprise leader compared to an individual leader. Self-awareness and evidence-based understanding of learning and development needs is far more effective than traditional, `sheep dip’ training courses at helping individuals to develop their skills and behaviours. Where appropriate, follow up executive coaching can really help embed change through guided experimental learning and reflection. This bespoke approach to development has the ability to really help individuals to understand their development needs and their contribution to how the enterprise is led. Matthew Davis is head of Talent Management at Ramsey Hall & The Occupational Psychology Group. He is also a part time Doctorial Researcher in Organisational Psychology at The University of Sheffield. Our work ranges from online psychometric assessment solutions and complex organisational development projects to leadership consulting and 360 feedback.